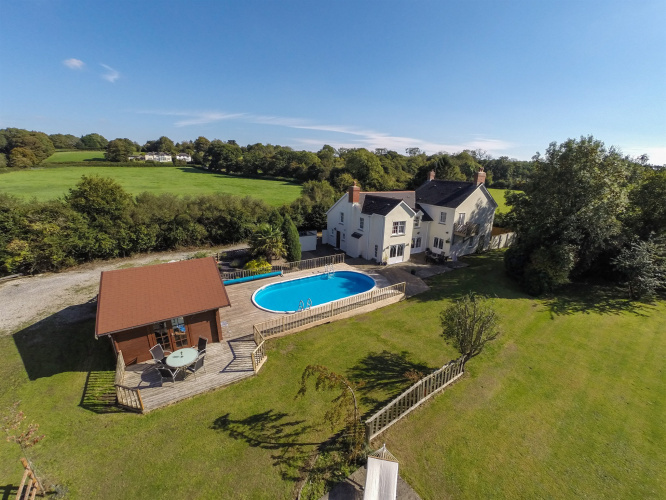 A truly stunning five bedroom detached country house, occupying an idyllic location surrounded by open countryside, and including an outdoor heated swimming pool, a large detached double garage, a four loosebox stable block and approximately 7 acres of land. Outstanding. Must be seen! 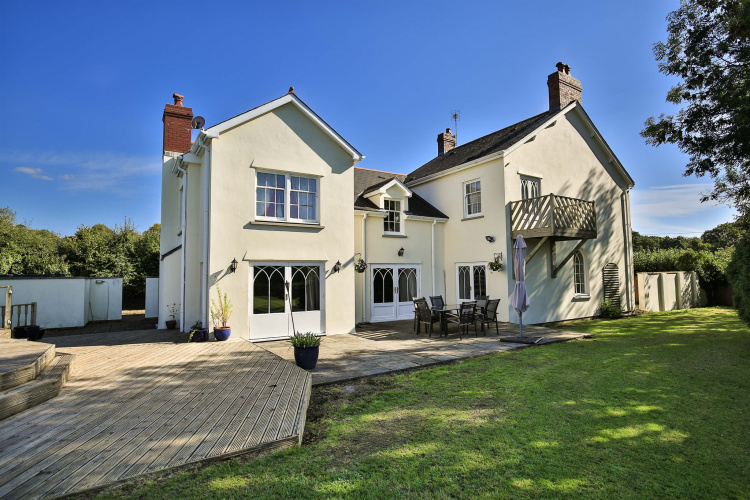 A hidden gem in the jewel of The Vale, Glenholme Farm is an exceptional five bedroom detached family home occupying a stunning position on the outskirts of the rural village of Peterston Super Ely. Originally built circa 1890, and greatly extended circa 1996, this most impressive house uniquely designed by the previous owner, has given careful consideration to both the amazing panoramic views and the natural light exposure enjoyed by all aspects of the property. It provides approximately 3500 square feet of well-proportioned living space. 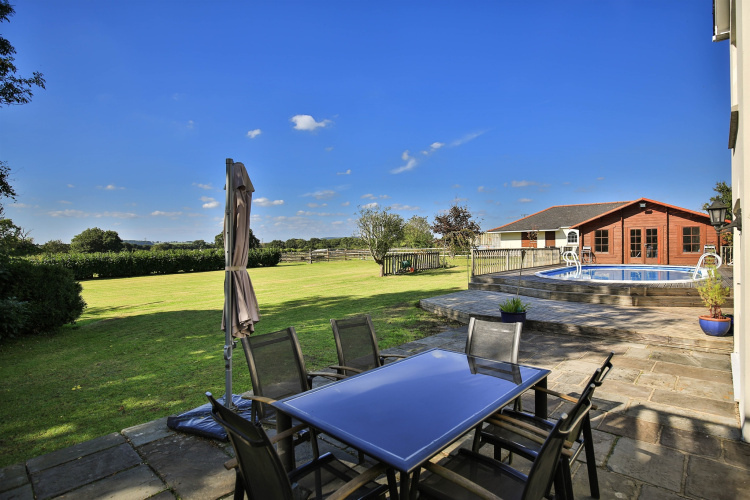 Nestled on the edge of the village, it has uninterrupted views of the surrounding countryside on four sides. This capacious home benefits from large landscaped private gardens and grounds, overlooking level green fields, a private electric fob operated gated entrance drive with space for the parking of ten cars, and a detached double garage. 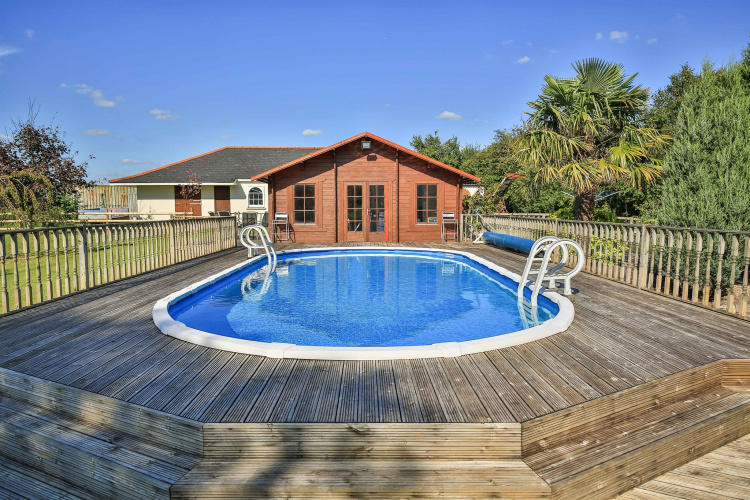 With delightful views from every aspect providing peace and quiet, a variety of wildlife can be observed throughout the year, giving a grasp of the full atmosphere this delightful idyllic location offers. This magnificent country home of character also includes a large fully heated outdoor swimming pool, a large decked sun terrace, a further private flagstone patio which faces the manicured gardens and grounds, a large detached summer house/changing rooms with built in shower room, and two separate stable blocks providing four individual looseboxes and a tack area. Adjacent to the property are approximately seven acres of level paddock land, ideal for those equestrian buyers, and providing comfortable livery for four horses. This unique family home includes sealed double glazed sash cord windows, flagstone floors, farm house pine panel internal doors, elegant panelled and coved ceilings, two large cast iron log burners and oil fired heating with panel radiators. Concealed within the gardens is a modern oil tank, private drainage (Septic tank 1996), mains water and electricity, propane gas cylinders, new slate roof 1996, a full re-wire in 1996, and a new stylish and contemporary kitchen added in 2016. 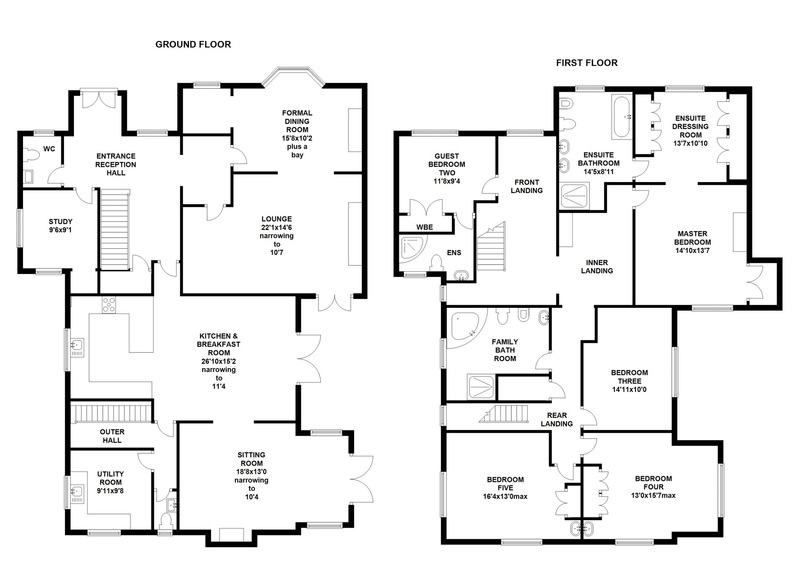 The well planned and versatile living space would also prove adaptable to two generation living requirements, with its two independent staircase providing access to both floors. 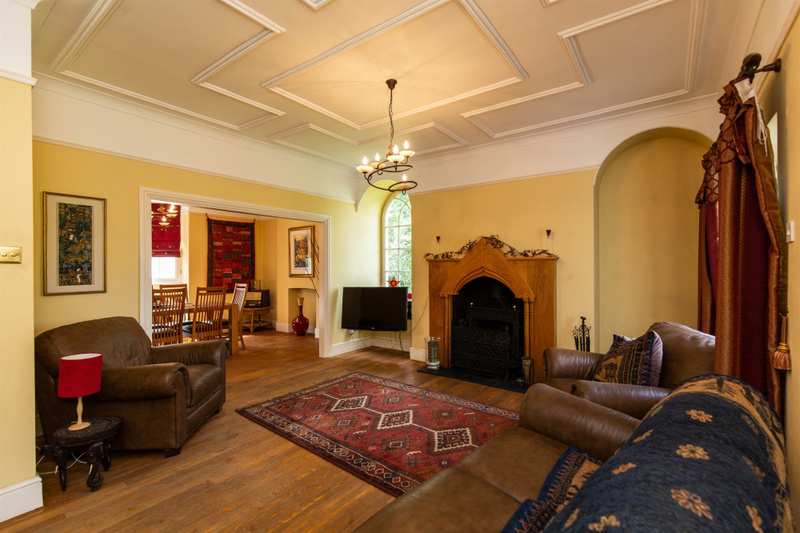 The accommodation comprises a grand entrance reception hall, two down stairs cloak rooms, a large study, a formal dining room (15'8 x 10'2), a spacious lounge (22'1 x 14'6), an open plan kitchen and breakfast room (26'10 x 15'2), a separate sitting room (18'8 x 13'0), and a large useful laundry room. 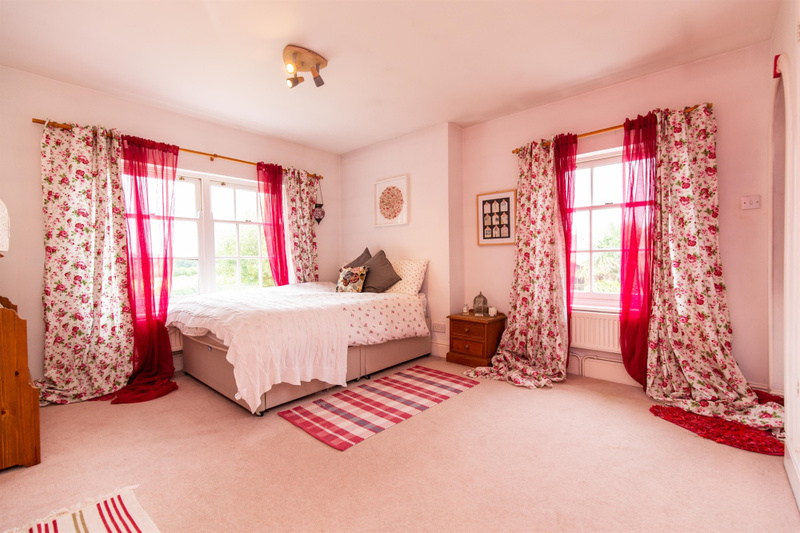 The first floor boasts three landings providing access to the five double sized bedrooms, whilst there are two ensuite bathrooms and a large family bathroom. The generous master suite comprises a large bedroom (14'10 x 13'7), a private first floor balcony with wonderful uninterrupted views, an ensuite dressing room fitted with bespoke wardrobes, and a large full size ensuite bathrooms equipped with two wash hand basins, a bidet, a wc, a shower and a large Jacuzzi bath. A magnificent detached unique five bedroom country residence in a most impressive quiet location with truly dynamic panoramic views across surrounding countryside. Must be seen. Peterston-super-Ely (Welsh: Llanbedr-y-fro) is a village and community in the Welsh county borough of the Vale of Glamorgan on the River Ely.The community population taken at the 2011 census was 874. As its name suggests, the village lies on the River Ely, on the other side of which is the Coryton estate. The local parish church (in heavily restored simple Perpendicular style) is dedicated to Saint Peter. There are small remains of a castle. Entering the village from the east (Cardiff) side one will pass the local village primary school on the right hand side and the first of two pubs, The Three Horse Shoes on the left hand side. Past the Pub lies the local village shop and post office. Within the village there is the The church of St Peters, playing fields, a village hall and the Sportsman Rest a very popular local country pub and restaurant. Local children are collected by bus for Cowbridge High School, and Cardiff is within 10 minutes drive. Also within a short drive is an exit onto the A 48 enabling fast travel to both Cardiff, Cowbridge and a link road connecting with Cardiff Bay, Penarth and the M4 (Junction 33). Llantrisant Road is also only a short drive away, providing an further exit onto the M4 (Junction 34). Continuing along the A 48 away from Cardiff heading towards Cowbridge, take the right hand turning signposted Peterston Super Ely, continue along a country road, bear right, continue along this country road until you enter Peterston Super Ely village, where on take the first turning on the left hand side, signposted Station Road, continue along for approximately 2 miles and on reaching a junction, bear left signposted Pendoylan. Glen Home Farm will be found a short way along on the right hand side. Approached via large solid Sapele wood panel doors, leading onto a slate threshold and opening into a large and imposing central hallway, equipped with a charming spindle balustrade single flight staircase with large under-stair gun cupboard. 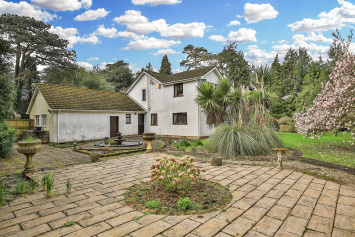 Pretty shaped sash cord style sealed double glazed window with outlooks across the enclosed block paved gated frontage entrance drive, double radiator, farm house pine panelled doors to all principle ground floor rooms. Armitage shanks period white suite, pedestal wash hand basin with ceramic tiled surround, WC with china handle, radiator, pretty-shaped sealed double-glazed sash cord style window to front, extractor fan. Inset with two sash cord style sealed double glazed windows with side drive and side garden aspect, useful deep recess storage area, radiator. 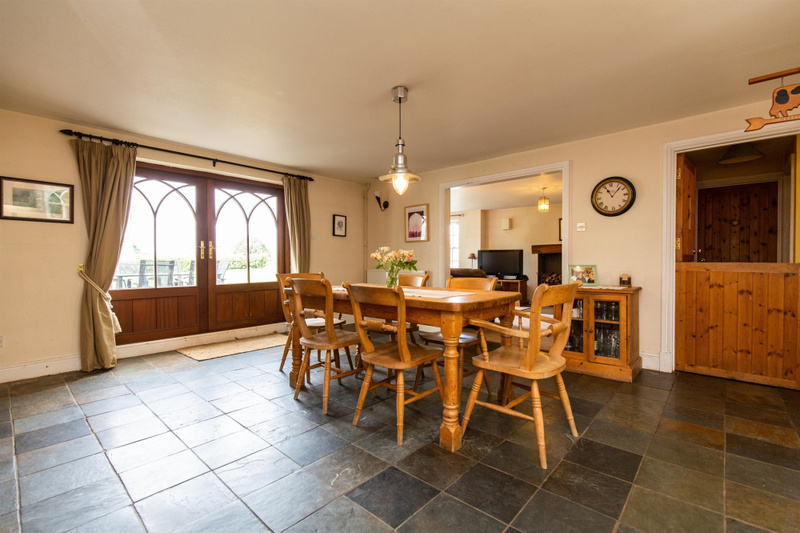 Approached from the entrance reception hall via characteristic archway opening with solid wood flooring and traditional panel doors that open to both the lounge and the dining room. 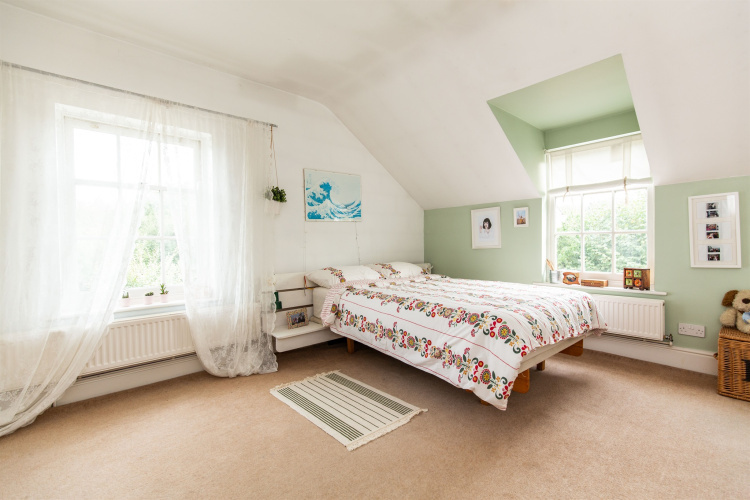 Solid wood floor throughout, elegant panel and coved ceiling, picture rail, period style recess study area with coved ceiling and radiator and multi pane sealed double glazed sash cord window to front. 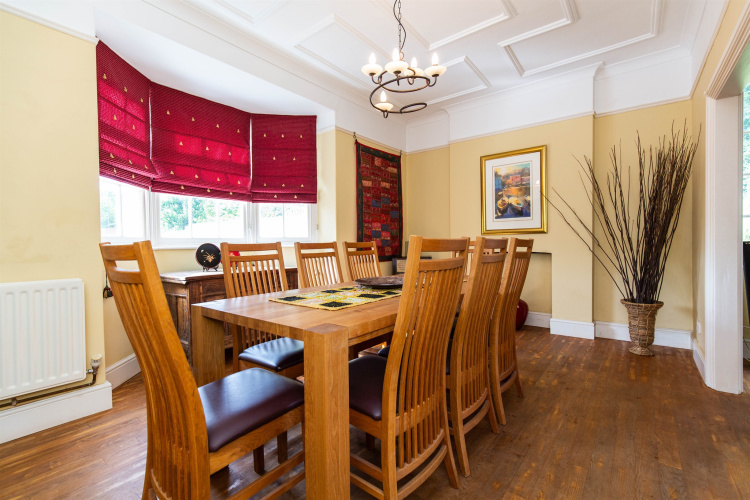 This charming dining room is inset with a wide splayed bay with outlooks onto the enclosed frontage drive, open fireplace, square opening leading to. 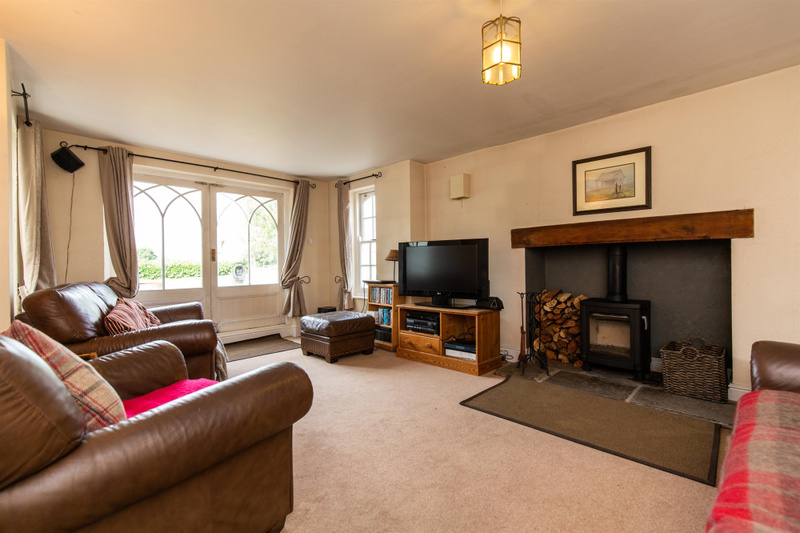 Continuous solid wood flooring, charming and elegant panel ceiling with coving and picture rail, large radiator, sealed double glazed French doors opening onto a flagstone sun terrace, solid carved oak character fireplace inset with a cast iron log burner, slate hearth. Further window with garden outlook. 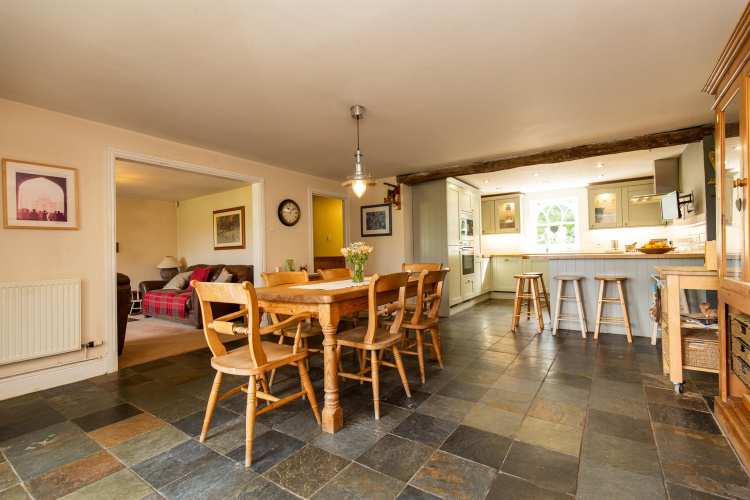 A wonderfully spacious open-plan living area, combining a breakfast room and a kitchen. Continuous slate flooring throughout. Oversized double glazed French doors opening onto a flagstone sun terrace, ample space for a large dining table and chairs. Opening leading into the sitting room, doorway leading into the inner hall. Kitchen area - newly fitted contemporary kitchen combining both modern floor and eye level units, chrome handles, solid oak work surfaces incorporating a white ceramic sink with chrome mixer taps, integrated Neff 5 ring gas hob, including wok burner beneath a stainless steel canopy style extractor hood with glass surround, walls part ceramic tiled, integrated Beko dishwasher, integrated Zanussi electric oven with matching Zanussi microwave oven, under unit lighting, deep pan drawers, retractable carousel chrome shelving storage compartments, soft closing doors and drawers throughout, custom made cutlery compartments, pull out recycle bins, integrated fridge and freezer, pull out full height larder cupboard with retracting multiple shelves, pretty eye level display cabinets with shelves and internal lighting, slate tile floor, peninsular breakfast bar, beam ceiling, spotlights, window with side garden aspect. Inset with oversized French doors which open onto a flagstone sun terrace, two further windows with garden views, open fireplace inset with a log burner, solid wood mantle, flagstone hearth, radiator. Double radiator, opening into kitchen and breakfast room. 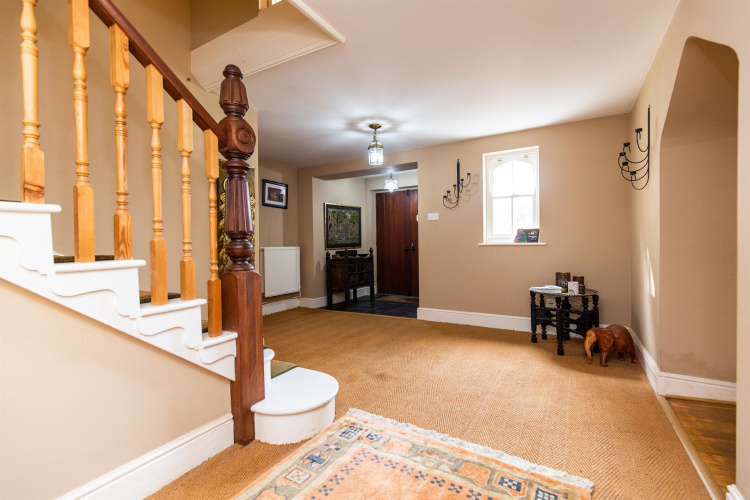 Approached from the breakfast room via a pine stable door, second spindle balustrade staircase leading to the rear first floor landing, radiator. Modern white suite with WC and wash-hand basin, window to side, slate tiled floor, extractor fan. 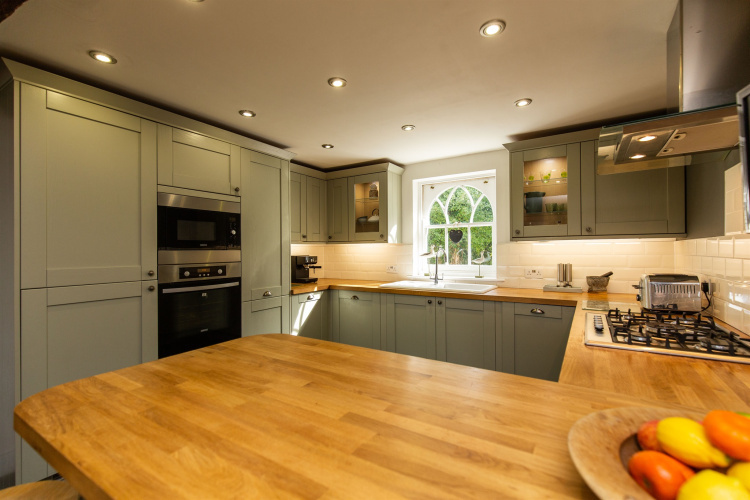 Fitted along two sides with a range of base units with laminate work surfaces incorporating a sink unit with drainer, free standing oil fired central heating boiler, two windows with side and rear aspect, radiator, stable door to rear gardens. Approached from the main entrance reception hall by a wide single flight staircase leading to a single balustrade landing, radiator, window to front, window to side, coved ceiling and access to the roof space, access to an inner landing and a further rear landing. Extensively fitted along two sides with a full range of bespoke panel fronted wardrobes with extensive hanging, shelving and storage space. A window to front, double radiator, coved ceiling. Modern white suite comprising shaped Jacuzzi bath with ceramic tile surround, chrome taps and pop up waste, twin his and hers wash hand basins with chrome taps, bidet, WC, separate shower cubicle with Triton Shower unit, extractor fan, window to front, double radiator, ceiling with spotlights. 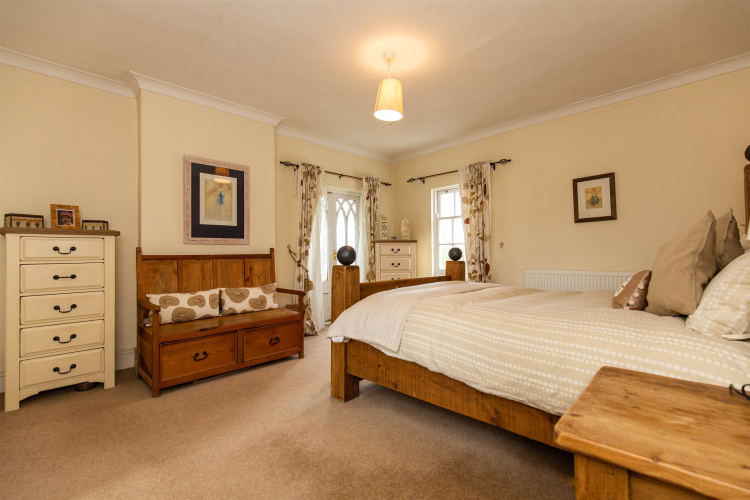 Plus a 2'0 x 6'5 FT deep wardrobe, Independently approached from the main front landing, equipped with deep built in wardrobes, radiator. Window to front. Modern white suite, comprising wash hand basin with chrome taps, a ceramic tiled surround, a shaped wall mirror and built out vanity unit, WC, corner shaped shower cubicle with ceramic tiled walls and Mira shower unit, extractor fan, window, radiator. 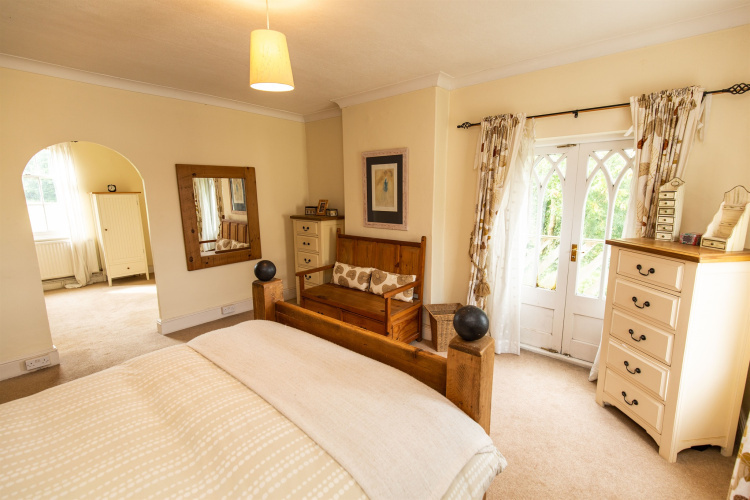 Window with panoramic views across the gardens and grounds and onto open countryside, double radiator. A spacious double sized bedroom inset with three windows, each with panoramic outlooks, range of built out wardrobes, vanity unit with wash hand basin, double radiator. A further double sized bedroom benefiting range of built out wardrobes together with a vanity unit and wash hand basin, two windows with outlooks over the gardens and grounds, radiator. 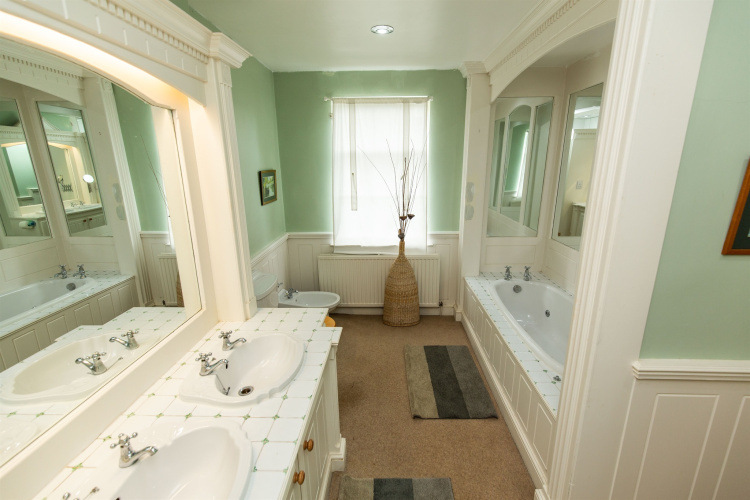 Modern white suite designed in a period style with part ceramic tiled walls and wood flooring, comprising corner vanity unit inset with a wash hand basin with mirrors over. 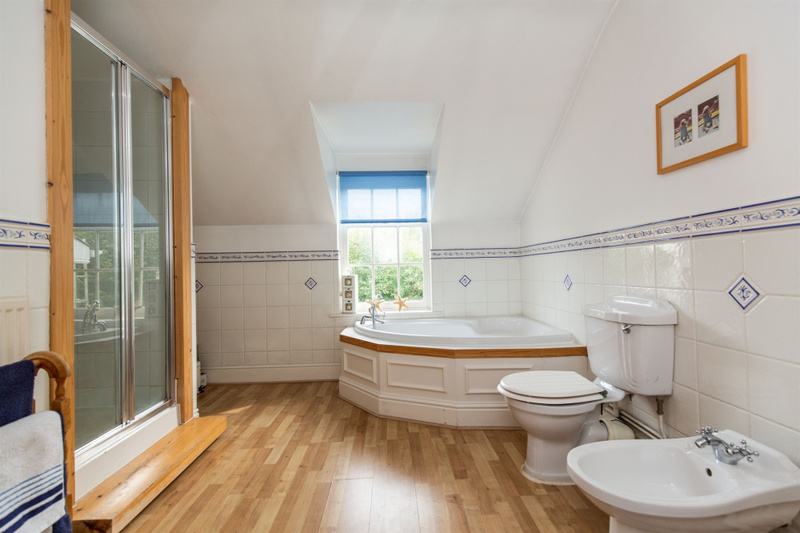 Shaped corner bath with chrome mixer taps and mixer shower fitment, WC, bidet with chrome mixer taps, pop up waste, window to side, separate ceramic tiled shower cubicle with chrome Mira shower unit, radiator, ceiling with spotlights, extractor fan. Approached via automatic electric gates, fob operated that lead onto a continuous block paved front entrance drive which continues to the side of the property, leading onto a large gravel stone turning circle providing access to the double garage, the two stable blocks and the outdoor swimming pool. 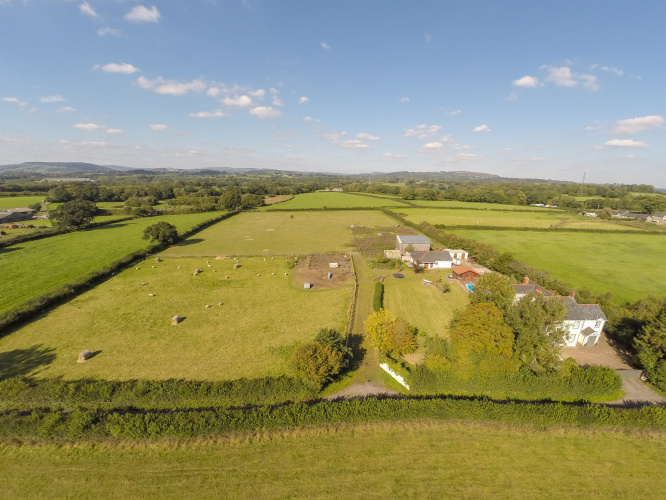 Beautifully manicured level gardens and grounds, forming part of a 7 acre plot including out buildings ,gardens and paddock land. 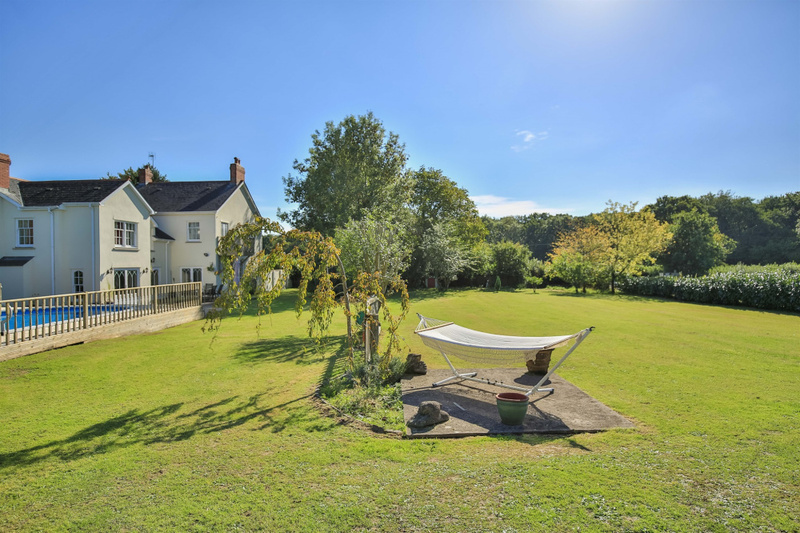 Approached from both the sitting room, the kitchen breakfast room and the lounge is a charming flat stone sun terrace which is very private, and faces the stunning grounds and the adjacent paddock land. Detached double garage, approached by two up and over doors, each electric and fob operated. Large open roof space, electric power and light, windows and courtesy door. Detached adjacent stable block overall; measurements above, sub divided into two separate loose boxes and a galley tack area. Both loose boxes are approached by independent stable doors. Attached to the double garage, sub divided into two loose boxes, each approached independently by stable doors. The overall measurement for the entire stable block is the above measurement. Detached summer house/changing rooms, adaptable and versatile, built in pitch pine and tongue and groove, electric power and light, and inset with two separate sets of french doors, further windows with pool and garden views, high open roof area, and incorporating a shower room equipped with wc, wash hand basin and a shower cubicle, Shaver point.